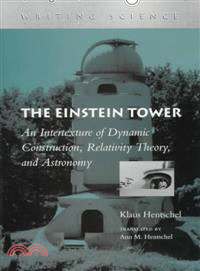 Science historian Hentschel examines the architecturally historic observatory that German astronomy Erwin Finlay Freundlich commissioned his architect friend Erish Mendelsohn to design so Freundlich could verify experimentally Einstein's general theory of relativity. The tower was built in Potsdam in 1920 but the effort failed. Hentschel interweaves Freundlich's biography, social aspects of professional contacts, cognitive aspects of his project, the political milieu within the Berlin research community, and astrophysics. Annotation c. by Book News, Inc., Portland, Or. Klaus Hentschel is Assistant Professor at the Institute for the History of Science at the University of Gottingen and a fellow at the Dibner Institute for the History of Science and Technology, Massachusetts Institute of Technology, for 1996/97.